Riccar is driven by one passion - to make world-class vacuums. Riccar upright, canister, eight-pound and central vacuums are sold exclusively through Authorized Riccar Retailers like Vacuum World where you will receive expert advice and professional service. As an authorized Riccar retailer, we will provide follow-up advice, accessory items, service, warranty work, and any other necessary services. 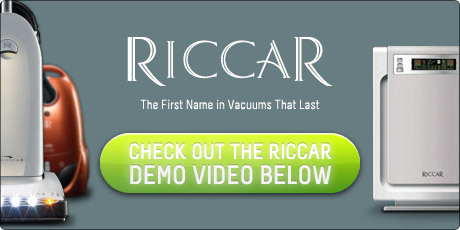 Riccar vacuums represent the highest standards in design, material, and durability, offering exceptional filtration and cleaning ability, plus unique specialty features. Riccar's factory is located in Saint James, Missouri and it produces some of the highest quality vacuums on the market today. Most of the well known brands you find in the "Big Box" stores have chosen to cut production cost by developing and importing most of their product from China/Asia, Malaysia and Mexico resulting in their making a lesser quality product. Riccar products are among the best made on the market today, and being made in the USA makes us and our customers happy to support a quality American manufacturer. In addition to upright and canister vacuums, Vacuum World also offers Riccar's Central Vacuum Systems, Zone Heaters, and Air Purifiers.